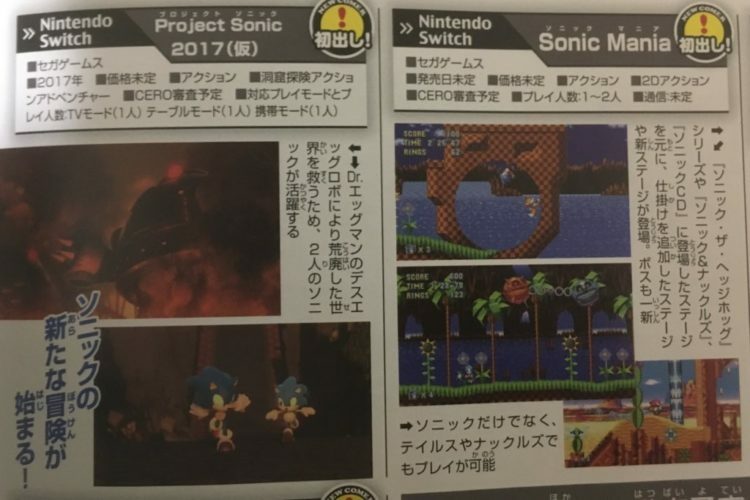 The latest Nintendo Dream Magazine from Japan has revealed new information about the upcoming Project Sonic 2017 game for the Nintendo Switch, PS4 and Xbox One. The blurb states that Dr. Eggman will be the main villain, that there will be no multiplayer features, and that the genre for the game is “adventure”. The magazine also features Sonic Mania, but the information included was revealed months ago. There will be more information on Project Sonic 2017 and Sonic Mania on March 16th during the SXSW 2017 panel for Sonic the Hedgehog, which you can learn more about here. Update: the magazine also confirms that Sonic Mania will feature multiplayer.